Thomas: Hello and welcome to a very special Halloween Shrunken Head review. This week we'll be looking at the latest entry into the Saw franchise. Thomas: Please excuse the interruption. This year the natives have decided to heck with their traditions and have rented out the tribal area to a fraternity, as a kind of Halloween theme resort. How you doing Smith? Smith: Clearly out of my element here. There were a lot of shenanigans going on at my old fraternity but nothing like this. Thomas: Indeed. Times have certainly changed. We won't let it be a distraction though. Frat Brother #8: Either of you dudes know where the bathroom is? Frat Brother #7: Brah, what're you askin' them for? They don't have bodies! Frat Brother #8: Hey yeah, they got nobody! Frat Brother #7: Good one Brah! Just go anywhere. Thomas: ...We'll try not to let it be a distraction. What did you think of the movie Smith? Smith: Typical Saw fare. This one made a lot less sense than the last one. Thomas: That's a problem with the franchise alright. Smith: Completely. Past a point I just closed my eyes during certain scenes so I could piece together my own movie. Thomas: That's one way to go. I know it's always an issue with you, so how was the gore? Smith: 3D. I guess that's the best you can say about it. The trouble with 3D horror that I've found is that it ultimately results in a less imaginative movie. The main draw of the Saw movies has always been the creative, over-elaborate kills. I felt that a lot of that was sacrificed in making it jump out at you. Kind of disappointing really. Thomas: I'll admit, I've never really been a fan of the series in a whole. Jeffrey, you've been quiet, what did you think? Thomas: Not possible. One requires a metabolism and that thing that comes with it. What's it called, a body? Smith: A bunch of the frat brothers flipped him upside down and poured a bottle of vodka in him. Jeffrey: I don't like pickles. What time is it? Smith: Poor, poor... actually I'm okay with this. Serves him right. Thomas: Maybe, but I hate to think of what a hangover is like for someone who is just a head. Smith: Ha! Yeah... Tomorrow will be fun. Thomas: I suppose there's no point in continuing with this travesty. For my own part, I've never been a fan of the series and this one didn't convince me otherwise. If you're a fan of the series I'm sure you'll be there to see what they're calling the last in the series. If you're not a fan, there are far better things in theater to see. Any final thoughts? Jeffrey: My shoe is untied... and on someone else's foot. Smith: I'm just glad that for once I wasn't the one being picked on. Frat Boy #1: Let's do shots out of Smithy's head! I agree - Jeffrey's drunk. Let's do shots out of Smithy's head! It's all great stuff. I hate it when my shoe is untied and on someone else's foot too. I loved the first 'Saw' because I let it get inside my head and that was fun. The rest of the franchise seemed to be for people who would torture baby animals. At least the 'Final Destination' movies had some fun with their imaginative deaths. A 'rube goldberg' kind of slapstick. 'Saw' deaths just seem mean if that makes any sense. I've liked all the Saw movies. There I said it. Tho' I'm not easily amused (yes I am) I am easily entertained...maybe they are one in the same, ah, who knows. Nice party though for Jeffery. Haven't seen any of these crap-my-pants movies...but Jeffrey is a hoot! That Jeffery, never takes any interview seriously. 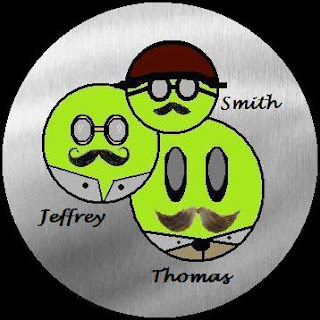 Also not sure I agree with Thomas and Smith. They can be a tad judgmental for shrunken heads.